The Three Minute Egg® is your One-Stop Yoga Prop. This new concept in yoga accessories combines the benefits of a block, bolster, belt and blanket, and packs them into one incredibly beautiful, versatile and easily transportable tool. As a student of yoga the Egg promises you the optimal amount of support available. As a teacher, incorporating Eggs into your classes will differentiate you from your peers. As a studio, the Eggs will find their way into all your classes, no matter how many styles of yoga you offer. The Three Minute Egg® was invented by Jason Scholder after years of practicing yoga — and a lifetime of back-pain. At first, Jason conceived of the Egg as a way to help him stretch his back; however, the product immediately intrigued a variety of fitness luminaries and together they continue to develop new ways for people to practice without pain. The Eggs are now utilized in yoga, Pilates, Barre, Chiropractic offices and other recuperative exercises. 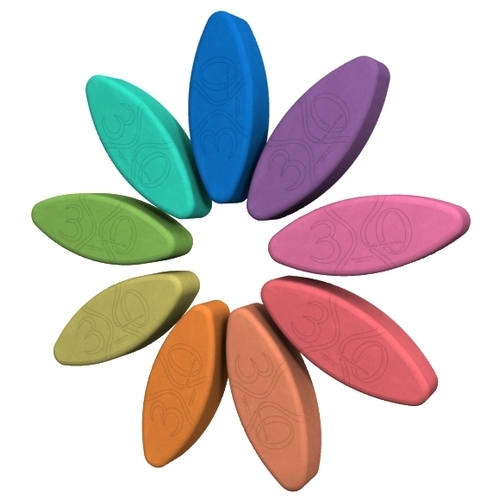 An ergonomic yoga block designed to work with the shape of your body, the Three Minute Egg® offers an unparalleled combination of comfort, protection, and support in both dynamic and restorative postures. No matter what style of yoga you enjoy, regardless what level of flexibility you have attained, the Three Minute Egg® will add new dimensions to your practice. To learn about specific postures, see our Andansanas (Egg postures) page.